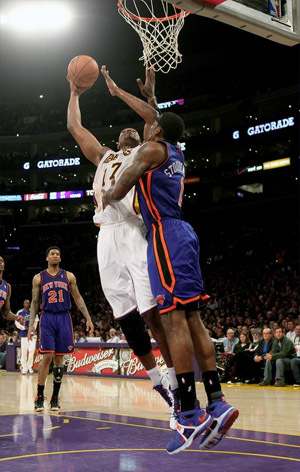 Andrew Bynum rises up for dunk against Knicks. The Lakers got tough on Sunday night, and played a very physical brand of basketball against the upstart New York Knicks, winning going away 109-87 at Staples Center. 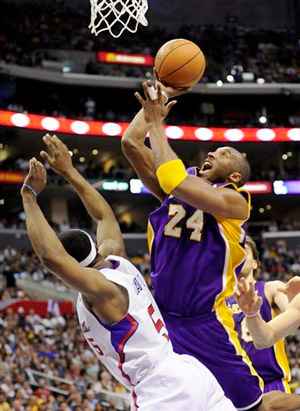 Kobe Bryant scored 27 points to go along with 10 rebounds, as the Lakers held the high-scoring Knicks to just 87 points on 36.0% shooting from the floor. The Lakers big front line pushed the Knicks around all game long, and dominated on the boards 61-42, including 17 offensive rebounds. 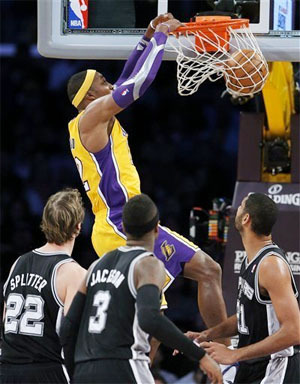 The game also had its share of chippiness, as the Lakers were assessed four technical fouls and a flagrant foul. Andrew Bynum scored 18 points and grabbed 7 rebounds in a strong effort against Amare Stoudemire, but was ejected from the game in the fourth quarter with two technical fouls for arguing a call against him. It was a game loaded with emotion and hard fouls. Ron Artest was hit with a technical early in the first quarter as it appeared he put his hands near the throat of the Knicks’ Shawne Williams. He then picked up a flagrant foul for dropping Stoudemire with a clothesline on his way to the basket in the third quarter. Bryant and Stoudemire also got into a heated argument moments later. The Lakers led virtually the entire game, although the Knicks kept it close early, thanks to a lot of early Laker turnovers. A late second quarter push gave the champs a 52-47 lead at halftime. After the break, the game got rougher, and the Knicks simply could not make shots. The Lakers led by double-figures for most of the second half. The Knicks got to within seven early in the fourth quarter on a three-point play by Stoudmire, but could get no closer, as the Lakers won going away by 22. Pau Gasol also had a dominant game up front, scoring 20 points, grabbing 14 rebounds, and blocking four shots. 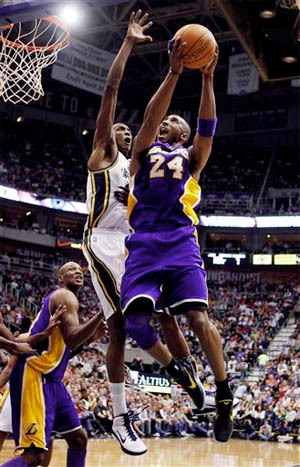 Shannon Brown had 16 off the bench, and Lamar Odom scored 13 points and a pulled down a season-high 18 rebounds. For the game, the Lakers didn’t shoot particularly well themselves at only 41.8% (38-91), although they did hit 8-17 from the three-point line, and turned the ball over only 13 times. After a sloppy start where they turned the ball over five times in the first five minutes, they committed just eight the remainder of the game. Taking care of the ball didn’t allow the Knicks to get into the transition game they desperately needed to in order to beat the bigger Laker squad. The Knicks were led by Amar’e Stoudemire’s 23 points, 10 rebounds, and six blocked shots. Stoudemire shot just 7-24 from the floor, and didn’t hit his first basket until the middle of the second quarter. In fact he scored 18 of his 23 points in the second half, but many were after the game was out of reach. The Lakers played their first game without backup forward Matt Barnes, who is scheduled to have surgery this week to repair a torn meniscus he suffered on Friday against New Orleans. The Lakers won’t have a timetable for his return after the surgery. The Lakers have now won four straight, six out of seven, and haven’t lost to the Knicks since February of 2007. Los Angeles’ next game is Tuesday night at home against the woefully bad Cleveland Cavaliers, who have certainly suffered without LeBron James. They’ve currently lost 10 in a row after their setback on Sunday in Phoenix, and are sitting with NBA’s worst record at 8-29.